I hosted author Margot Theis Raven at my library along with Col. Gail Halvorsen in the fall of 2003. At that time she was working on a book called America's White Table. She was in the middle of discussions with her publisher about some of the wording. I always marvel at the polishing and reworking of books with 32 pages and 500+ words. She had the manuscript of the book with her and read it aloud to a group of us. I listened with huge tears in my eyes. The AP has a moving article by Bruce Smith about the book and the custom of the remembrance White Table. It gives the background of the story and tradition that started with the Red River Valley Fighter Pilots Association also known as the River Rats of Vietnam. Read the whole thing. but it felt as big as America when we helped Mama put each item on it and she told us why it was so important. "We use a Small Table, girls," she explained first, "to show one soldier's lonely battle against many. We cover it with a White Cloth to honor a soldier's pure heart when he answers his country's call to duty." "We place a Lemon Slice and Grains of Salt on a plate to show a captive soldier's bitter fate and the tears of families waiting for loved ones to return," she continued. "We push an Empty Chair to the table for the missing soldiers who are not here..."
Raven hopes this will become a tradition with American families like flying the American flag. I am going to go iron a white table cloth. I think we will prepare a table tomorrow. Raven also authored Circle Unbroken (The Story of a Basket and Its People) which is on the Texas Bluebonnet reading list this year. It is about the traditions surrounding the beautiful Gullah sea grass baskets. She is also an artist whose paintings are exhibited in Charleston, SC art galleries. I used to find photos of her work on the web but I could not today. We saw Star Wars:Revenge of the Sith last night. Overall very enjoyable. Lucas did a fine job. The movie is beautiful to look at. There are times you just want to still the action and look at everything going on in the shot. That is what DVDs are for. Daughter no. 2 pointed out all the musical themes that were echoing at different points in the show. I finally figured out something that has bothered me about the movie though. All the women just sit around, empty handed, on sofas and sit and sit and sit. I know Padmé is pregnant and cannot be an action figure but you would think that she would have some paper work to do or diplomatic business to transact or some booties to knit or a parenting book to read. 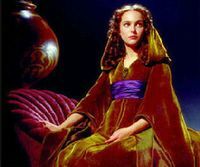 If I were Padmé and all worried, I would be biting my nails or drinking some tea or chomping on some chocolate or making a list of the "top ten signs your guy is turning to the dark side" but not sitting placidly on a cushion with my hands in my lap all the time. To be fair, she does stand looking out the window a lot too. At the end of the movie Leia's new mommy is also just sitting there, empty handed when Jimmy Smits comes in with the baby. Apparently in a galaxy far far away women have nothing to do but brush their hair and wear a new outfit in every scene. 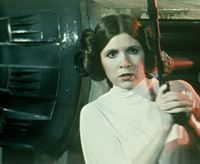 Makes me appreciate Leia/Carrie Fisher picking up a blaster and shooting every stormtrooper in sight in The New Hope. 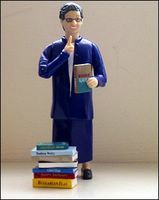 Here is another good article about boys and reading: the grosser the better! ...some teachers are loading up on "boy books." They feature sports, adventure, blood analysis - even the science of scabs and snot. 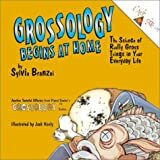 "My boys are obsessed with a non-fiction series called 'Grossology,' " says Tracy Moran, a fourth-grade teacher at Summit Elementary School in Anderson Township. "It's stuff like, 'Why do burps happen?' "
Moran recently attended a conference on connecting boys to books. Female teachers, she says, have traditionally gravitated toward girl-oriented literature - plots built around characters and social interaction. Such plots bore boys and might permanently affect their interest in reading, experts say. Author Jacqueline Wilson has been named Children's Laureate in the UK. My job for the next two years is to promote the cause of children's literature, make it more high profile, encourage every child in the country to read more," said Wilson. "I am going to try very hard to encourage families, schools, hospitals and children's homes to start reading aloud to very young children. "I think if you get a child interested in books before they can read themselves that will get them hooked on books." She is probably the most widely read children's author today. The article reports that 30 million copies of her books have sold but she continues to personally answer every child who writes to her. I must read some of her books. This article from the Washington Post really struck a chord with me professionally and personally. Sherre Sachar comes from a book-loving family. Her father, Louis, is an award-winning author, and the graduating senior thinks that settling down with a good book should be one of life's great joys. But as she prepares to leave high school and head to Cornell University in the fall, she is tired of reading. The extensive required reading in her high school classes -- including Advanced Placement English Literature, where she flew from one classic to another -- left her with no time to pick up books she thought would be fun. And she was frustrated by teachers who offered either too little help in understanding the complex texts or conducted tortured efforts to wring symbolism out of every word. AP testing has become big business as families try to shave college costs by gaining college credit in high school and students work to boost their GPAs. I am VERY sympathetic to this point of view. There is also intense social pressure to keep up with the "high-flyers" and students often feel that AP classes prepare them for the rigor of college courses. As a result AP literature classes are full and students are slogging through William Falkner, John Steinbeck, Jane Austen, Hawthorne, Robert Penn Warren, Amy Tan, Daniel Dafoe, Nathanial West, Upton Sinclair, Joseph Conrad, Hermann Hesse (oh spare me,) and on and on. I am absolutely in favor of studying the classics. I love tuning into Book World because she is taking on Don Quixote and Tristam Shandy. In the hands of a good teacher students can appreciate and understand why they are being asked to read these books. Sadly though, too often it becomes a death march instead of a voyage of exploration. How many times did I ask my kids what they had learned about the author or why the book was in the canon only to learn NO background or supplementary information had been shared at all? As parents we filled in those blanks but what about the other kids? In daughter no. 1's case, tests were 100 questions to be answered in 50 minutes covering surprising minutia. "When they stopped for gas the third time on the way to California, what was the name of the street the gas station was on?" (A friend referred to the tests as Accelerated Reader on steroids.) I was always hopeful, "was there some significance to the name of the street?" "No just she is just making sure we had read it." With high-stakes standardized testing driving curriculum and teachers increasingly required to use scripted lesson plans, what is getting lost for many teachers is the freedom to allow students to explore books of their choosing -- and the time to explore the meaning, the educators say. There is excellent YA literature that addresses similar themes as books on AP reading lists. One of my most inspiring professors, Kylene Beers, advocated pairing aYA book with a classic as a way to make the ideas more accessible for students. I have always felt that students should read The Giver before tackling Orwell's 1984. All this combined with the concerns that we are loosing a generation of boys as readers and I wonder why we are going about this so wrong-headedly. When it came time to choose the AP or regular track in English for Daughter no. 2 I told her to study George Elliot and Falkner in college with professors who were qualified to talk about them. She still read and studied many important books (Beowulf, Huck Finn, Shakespeare, Animal Farm) but she had time to enjoy and continue to read for pleasure. The CSMonitor has a thoughtful article on the reading material guys prefer in high school and literature classes. It addresses the differences in girls and boys learning styles and has concrete suggestions for helping all students. Boys are naturally drawn to action and movement, he points out, and teachers need to find ways of integrating their energy into the reading process. When he works with early readers, Mr. Johnson shortens the material and sets up give-and-take question-and-answer sessions both before and after the kids do their reading. He also encourages them to move around the classroom physically, taking a break at the end of the chapter. "We found that boys were more interested in the text" with such an approach, Johnson reports. Minus the "baby stuff," he recommends the same techniques in the upper grades. Children's author and teacher, Richard Peck and reading specialist, Ray Johnson recommend titles such as The Great Gatsby, Catcher in the Rye, A Separate Peace and Red Badge of Courage. Good piece, read the whole thing. Fourteen year old Bethany Hamilton became a celebrity overnight when a shark bit off her left arm while she was surfing one October morning in 2003. Written in a simple narrative style, Bethany describes her love for her family and surfing as well as her life before and after the shark attack. Living in Hawaii, she comes from a family of surfers. She discusses her faith in God and the strength she finds in her relationship with Jesus Christ. Her description of the events of that morning are the stuff of nightmares, "suddenly there was a flash of gray." Bethany's father was awaiting knee surgery in the local hospital operating room when the news came in that a young girl had been attacked by a shark and the room was needed for that emergency. He said later he knew in his heart it was his daughter. The quick thinking of her friends and appearance of a paramedic on the scene helped save her life. There is no doubt though that her survival was miraculous. She learned later that she lost almost half her blood volume. In many ways she is amazed at the interest her story has generated. She does convey her deep faith and hopes that her experiences will serve a greater purpose and help others in times of trouble in their lives. She is just a kid so do not expect high falutin' prose but this is a touching story and the chapter that describes her return to surfing for the first time is quite moving. Today is Armed Forces Day described as "a single holiday for citizens to come together and thank our military members for their patriotic service in support of our country." Today would be a wonderful day to read Mercedes and the Chocolate Pilot: A True Story of the Berlin Airlift and the Candy That Dropped from the Sky by Margot Theis Raven. The Berlin Airlift is overlooked in the mad gallop through the curriculum that characterizes history education today. There is so much to cover that it is difficult to give events their proper weight and attention in the final weeks of school. A history buff myself, I knew very little about the airlift when I began to share this story with my students. From June 1948-May 1949, American and British pilots demonstrated extraordinary bravery, stamina and service as they flew the air corridors to Berlin with desparately needed food and fuel after the Soviet Union blockaded that city. They encountered poor flying conditions, harrassing Soviet air craft and heavy air traffic. Thirty one Americans paid the ultimate price for the people of Berlin. This book tells the true and uplifting story of the American Air Force pilot, Gail Halvorsen, and his gift to the children of Berlin. Young Mercedes lives in a city devastated by war. She takes care of her chickens and watches the planes fly overhead on their way to Templehof airport. Illustrator Gijsbert Van Frankenhuyzen's paintings depict the rubble of the city. The walls of Mercedes's home have been damaged by shells and are pockmarked with bullet holes. Her mother reads to her about the American pilot who is dropping candy to children and agrees to take her to the airport where the drops are happening. Mercedes is outrun and outreached by the other children so she writes Halvorsen a letter asking him to drop some candy in her back yard. When Halvorsen gets her letter he mails her a package of treats instead. The close-up picture of her face as she opens the box is one of my favorites. The moving epilogue describes the reunion of Mercedes and Col. Halvorsen years later and his continuing humanitarian work for children in war torn countries today. The checkout aisles of every store offer countless carbohydrates and calories in the form of chocolate and sugar. The idea that kids had gone for years without candy or a treat of some kind was almost unfathomable to my students. I was fortunate to have Margot Raven and Gail Halvorsen visit my school library in the fall of 2003. I drove them from the airport and to the hotel. The whole time I kept thinking "You have Gail Halvorsen, hero of the Cold War in your car!" In person Halvorsen is one of the warmest, kindest people I have ever met. He has a spiritual aura that touches the hearts of everyone who meets him. I will never ever forget him. Scholastic is offering kids the chance to explain "Why I Love Reading Harry Potter" in 300 words and win a trip to London. New York, NY (May 16, 2005) -- To kickoff the two-month countdown before the release of Harry Potter and the Half-Blood Prince, Scholastic is conducting a national essay contest asking kids to write an essay explaining “Why I Love Reading Harry Potter.” Ten lucky winners, each with a chaperone, will depart on the last flight out of New York City to London on July 15th, American Airlines flight AA116. At 12:01 a.m.(EST), after being held under tight security, free copies of the brand-new Harry Potter and the Half-Blood Prince, provided by U.S. publisher Scholastic, will be handed to each of the 10 winners and to every passenger onboard to read during their flight to London. As part of the grand prize, the winners and their chaperones will also enjoy a 4 day/ 4 night vacation to London, England. The ten winners will be announced on NBC’s Today on July 1st, 2005. Time for youngest daughter to start writing. I am so going to be the chaperone. Hope you have been reading the funnies this week. Many of my favorites have been devoted to reading and libraries. Frazz has been really wonderful. I love today's. I was surfing around several illustrators blogs and I noticed several of them are participating in Illustration Friday. Looks like anyone can participate. The idea for Illustration Friday stemmed from PhotoFriday.com. Penelope came across this site and wanted to participate, but wasn’t handy dandy with a camera. So Illustration Friday was born. Topics are picked each week from a list of suggestion that have been emailed by participants. If you are intrigued by the creative process illustrators go through as they create their wonderful books, check out some of their blogs. NPR's "go to" librarian and iconic action figure, Nancy Pearl, was on NPR this morning with a list of fantasy genre children's books that would make great family read alouds this summer. She echoed one of my ongoing concerns: families seem to stop reading aloud together once the kids learn to read on their own which is very sad. JKRowling will read to 70 kids at Edinburgh Castle, on the stroke of midnight July 16. The young fans will be chosen by newspapers in Britain, Ireland, South Africa, Australia, New Zealand and Canada. On the stroke of midnight Saturday 16th I'll be giving the very first reading from the book at Edinburgh Castle for the cub reporters, who will be given a signed copy of the book. The reporters will then have the weekend to read the book in a specially created Reading Room at Edinburgh Castle, before attending the Children's Press Conference Sunday 17th July to grill me about it. College graduation this week end! Yippee! One down! Jon Scieszka did an interview on NPR about his favorite subject, boys and reading. Boys score worse in reading than girls and many of them admit their dislike of reading. He feels our efforts to be gender neutral on reading lists have done boys a disservice. Boys reading tastes are very different from girls. He asks us to ponder what is going on with boys and reading? Scieszka: "We are promoting such a narrow version of literacy that we are not including what a lot of boys like." His latest book Guys Write for Guys Read is a collection of comics stories and advice for boys. After you listen to the interview read the extra content on the site. I was thrilled to see a Frankie Pagoda story by Jack Gantos there. I read it aloud to my daughter and asked her to guess who the writer was. She knew it was Gantos immediately. No one else can write with that special mix of wincing pain, hilarity and outrageousness! The Jack Henry stories are a very special to our us. They made our family laugh and laugh and laugh one summer as we began learning to deal with Type 1 diabetes. I don't know why this book did not win the Newbery Award this year. I do know that I will be thinking of Luther T. Farrell, his best friend Sparky and his "crew" for a long time. Luther is a bright thoughtful 15 year old with penchant for philosophers. His focus in life is to win the school science fair for the third year in a row. When not going to school he is thinking about Shayla, the love of his life since kindergarten. He works for (and also fears) his mother, known as "the Sarge." He must clean up her rental properties after the tenants been evicted and take care of his crew of elderly men who live in one of his mother's group homes. He shaves them, feeds them and cleans up after them. Luther's wry commentary and outlook on life infuse the story with humor and poignancy. Luther is fully aware of the Sarge's deficiencies as a parent and human being but he accepts his life because she is putting money for college into an account for him in payment for his work. He understands that his mother has traded in her humanity for financial success as a loan shark and slum lord but he is naive about lengths she will go to protect her empire. Christopher Paul Curtis creates the most likable characters. (I have always felt like Bud in Bud Not Buddy was one of the bravest kids I've ever met in a book.) Luther is another great character. He treats his crew with dignity and kindness. He is totally clueless when dealing with Shayla and his exchanges with his best friend Sparky will make you laugh out loud. Sparky's goal in life is to achieve an injury that will result a cash award from a personal injury lawsuit. His harebrained schemes are hilarious. As the story unwinds, the reader is routing for Luther to find a way out and hoping for a softening of the Sarge's heart. The ending of the book is neatly done. You will cheer. Michael Boatman's reading perfectly captures the voice and spirit of the story. 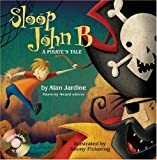 I highly recommend this audio book and I agree with School Library Journal that this story would be best appreciated by readers grade 8 and up. The trailer for The The Chronicles of Narnia: The Lion, the Witch, and the Wardrobe which premiered Saturday night is online now. "If you rip, tear, shred, bend, fold, deface, disfigure, smear, smudge, throw, drop, or in any other manner damage, mistreat, or show lack of respect towards this book, the consequences will be as awful as it in within my power to make them." " Dark and difficult times lie ahead, Harry. Soon we must all face the choice between what is right...and what is easy." Wise Albus Dumbledore, headmaster at Hogwarts, often has the most thoughtful lines in the stories. Walden Media has acquired the rights to Susan Cooper's sublime Dark is Rising Sequence. My oldest daughter re-re-re-re-read Silver on the Tree so many times, the cover fell off and she still read it over and over again. 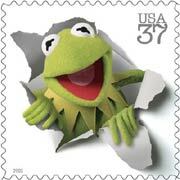 Walden continues its commitment to bringing the best of children's literature to the screen.